On the Summer solstice, the mason bee chalet was brought in for pre-Wintering. 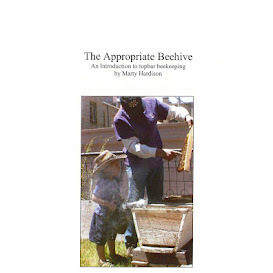 Inside the house, the developing bees were protected from the intense Colorado sun and heat, and allowed to metamorph comfortably and undisturbed. I didn't know they were already under attack until I pulled the trays out of the chalet today. The electrical tape banding the trays together had failed, and tiny chalcid wasps had made their way in. The yellow tray was the only one that had stayed shut. Tell tale holes where the wasps entered each cocoon. Chalcid wasps that matured inside a cocoon. Parasitic wasps were unable to gain access here. The cocoons seemed smaller this year, making it difficult to clearly differentiate the males from the females. Some of them I had to assume were female, simply from their position toward the back of their tube. Ideally 6 out of 10 cocoons would be male, but my guess is that we have disproportionately more males than females. 51 cocoons were lost to the wasps. There are some mason-bee-ers out there recommending candling, but I think at this point there's no point. It appears that the wasps fully matured inside our cocoons and then died. LESSON LEARNED: window screen is not fine enough. Next year, as soon as BOB activity stops, I'm putting a nylon stocking around the whole house. I'll be monitoring the observation tubes, and will let you know if something's awry. UPDATE: May 2013 - there were about a dozen duds. The bees never emerged from their cocoons. What they all had in common was uneaten pollen. It seems that if the larva does not eat all of its provisions, it will not have enough fat stores to make it through to Spring or enough energy to chew its way out. If you click on the image of the yellow tray, you can clearly see one mason that didn't eat all its pollen. When you find a cocoon like that, anticipate a dud. If you place your cocoons out in stages in the Spring, these are the first that should be pulled out of hibernation. What a heartbreaker. I bought the Chalet also. I'm glad we took it down last month to store in the cooler til next March. I noticed today there's a bunch of wasps on the bamboo behind my log hive. Looking it up on the web, turns out the wasps 'lick' the bamboo to get material for their paper nests. I got some close up video without them bothering me at all. I feel your loss concerning the Mason bees. Thanks for posting this. Looking forward to your report next March, @Solarbeez. We started this season with 56 cocoons, so 2012 was a good year for the mason bees. It wouldv'e been a great year, had I paid better attention. I do feel guilty, but at the same time the chalcid wasps are native bees, so they have a home in the Backyard, too. Ya know, I feel the same way. Last year we lost a HTBH to the wasps...well, sort of. The hive swarmed two months after we hived it from a swarm...not sure why, but we had been advised to feed it sugar water to get them to build comb. I'll not do that again. When that hive swarmed the queen never made it back from her mating flight, so that hive was virtually 'doomed.' That's when we started noticing the wasps. We could see them gather around any bees that landed on the ground below the hive and start cannibalizing them. It has heartbreaking. My wife and I were so angry, but we looked it up on the web and realized that wasps are native while honeybees are not. We were advised by more than one of our fellow beekeepers to hang wasp bait traps out, but wasps have their place in nature and is it right to favor one species over another? Tough questions. I think we would have lost the hive anyway without a queen, so what would be the point of killing the wasps? This year the bees seem to be holding their own even though both hives are close to the bamboo. Fingers crossed. @Anonymous Thanks for visiting and leaving a comment! We'd love to hear more from you, but anonymous comments will no longer be published. May I suggest OpenID for your convenience.